When reassigning a task, it is often difficult to locate the task in the drop down list. There could be well over 700. There are a couple of features to assist the user to quickly locate the required Task. In addition to the instructions below in red, the user can tap the + button to open the drop down list. Tap on Clear near the top of the screen, and the contents of the drop down list will be cleared. 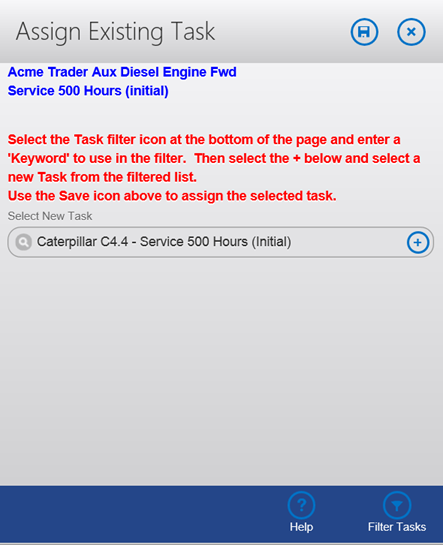 Next, select the drop down list by tapping and entering the first 4 or 5 letters of the task title. Minimum is 3 but more is best to narrow the search. By tying in 'Fuel', will show all tasks with 'Fuel' in the title. This could include 'Caterpillar C4.4 - Fuel System Prime' and also 'Fuel - Separ Water Probe Test'. Tap the required Task and then tap Save.